I had not expected to speak today, so you must forgive me, Mr Chair, if I am not as polished or eloquent as the member from Matara who spoke first today. However, having heard his misleading statements, I felt they needed refutation. Mr Chair, listening to the whole Opposition during this budget debate, one felt that they were like the Bourbon dynasty in France, in that they have remembered nothing, and forgotten nothing. Indeed Mr Mangala Samaraweera, in claiming that he had been dismissed from the Cabinet, in his strange and childish excursion into numerology, seemed to have forgotten that, far from having been dismissed, he had himself resigned, in a grand gesture of solidarity with Mr Anura Bandaranaike – who promptly went back into the cabinet, leaving his colleague out in the cold. And in criticizing those who changed parties in Parliament, he has forgotten his own history. It was also sad that he has forgotten all about the fickleness of fashion. When I first knew him, he was a very distinguished fashion designer, who rejoiced in the name of Mangala Innocence, whether appropriately or not I cannot say. He should know that fashions change, and sometimes several different styles are in fashion at the same time. Thus he spent much time in quoting from Bloomberg, as though it were the final word, without reflecting on all the different approaches that we see in other media outlets today. We can all play quotation snap, Mr Chair, and for every negative quotation he finds, I can find a positive one, as for instance the note in the Times, a paper long hostile to Sri Lanka, that ‘Senior figures in the IMF say it is broadly happy with the steps Sri Lanka is taking to start to repair public finances ravaged by 30 years of civil war’. But what I missed in the speech was actual attention to the budget itself, as though talking about what someone abroad said is more important than what is happening in Sri Lanka, more important than the reactions of our own business community. Anyone looking through the budget itself, studying the presentation of the developments taking place and planned all over the country, will realize that this budget finally achieves the balance between the need for development and commitment to equity that has so long eluded us. It is in fact an ideal Liberal budget, as one of my colleagues who has now joined the government side, put it. Thirty and more years ago, Mr Chair, one reason the Liberal Party was set up, apart from the attacks on constitutional freedoms and pluralism that the Jayewardene regime was engaged in, was the need to express a new economic vision. We were glad that the statist socialism of the previous government had been laid to rest. But we were also disappointed that, instead of liberalizing the economy through a genuine process of privatization and partnership, through regulations that promoted competition, President Jayewardene assumed that reducing the role of the State meant promoting profits for his friends. Of course crony capitalism was popular in those days when, with the Cold War still raging, anyone who rejected communism won the support of the international community. He counted then on continuing support, whatever he did, and indeed for a time he got it, even for his appalling referendum to postpone elections. The UNP, and the member from Matara, in his allegiance to a leader who defended the worst excesses of those days, has forgotten that in those days there was no concern whatsoever with equity. 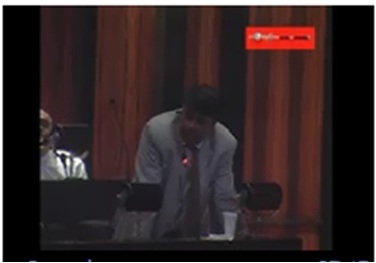 In hearing members of the UNP bewail the blows they claim this budget gives to the working man, I wonder how they forget the treatment of the strikers of July 1980, attacks that their friends in the West then ignored, thinking this brought stability. But times have now changed, and even the international community has realized that some principles cannot be sacrificed for the sake of others. Thus, when the UNP government of 2002 asserted that political freedoms were second to economic development, it was stuck in a mindset that the world had left behind. Similarly, Mr Chair, in criticizing the loans this government has taken, the current leadership of the Opposition has forgotten the massive debts contracted by the Jayewardene regime, debts which however made sense in terms of the development that resulted. Unfortunately there was no attempt in those days at equitable growth, a deficiency that it is now clear has been overcome by the nationwide changes this government has promoted, beginning even before it was able to overcome terrorism. Paying no heed to this, the Member from Matara insists on purveying myths about discrimination. He claims that Tamils were prevented last week in celebrating a festival. Astonishingly, this claim has not been reported in the papers which, contrary to his assertions, do not suffer from intimidation. On the contrary, anyone reading our papers will see how openly critical they are of government. But ignoring the national press is part of a technique that his leadership perfected in carrying out propaganda against this country. I would recommend instead that he do what we did during the war, in carefully monitoring Tamilnet, so that we could show afterwards that the inflated claims about civilian casualties were all nonsense. Given the very limited allegations during the war, it was possible to show that assertions of war crimes were nonsense, indeed afterthoughts in the new form of battle the rump of the LTTE has embarked upon. Similarly, if he looked at the Tamil dailies in the last week, or the opposition press that is quick to highlight any possible deficiency, he would not find any suggestion of his outrageous claim, about a festival that he could not even identify clearly. Again, in claiming that colonization is taking place, through the provision of dwellings for the military, he forgets that, eighteen months ago – not two years, as he claimed in his carelessness – just after terrorism was overcome, the accusation was made that we would keep the displaced imprisoned for years, while settling Sinhalese in the North in their place. Now that almost all the displaced have been resettled, we have not heard a word of apology from those who confidently made such allegations. Now the myth is that there are going to be cantonments, whereas the government has made it clear that, while there will certainly have to be military camps, these will be confined to small areas. As I have told my friends in the former TNA, Mr Chair, instead of propagating myths, they should accept the need for a small military presence, and work together with government to ensure that that presence will not be intrusive, and that it will be based on the multiracial, multilingual truly national security force that His Excellency the President has envisioned. That multilingualism, Mr Chair, is part of the human resources development that this government alone had the courage to embark on. One major problem about the type of capitalism President Jayewardene introduced was that it provided no opportunities for the bulk of our people. He kept our education system in the straitjacket he had first begun to impose on it when, back in the fifites, he made English medium illegal at primary level. Certainly we have an excellent system of basic education, but we know that at higher levels we must do better. But it is only this government that has had the guts to announce a comprehensive reform of education, in accordance with the best Liberal principles. I am sorry that there is criticism now of the type of economics the UNP government of 2002 followed as being neo-Liberal, which is a misnomer, neo-Conservative being a better description. But whatever one calls that philosophy, it is very different from Liberalism, which affirms forcefully the need for the State to provide basic services for the deprived, so as to provide them with opportunities to participate fully in the social and economic life of the country – while at the same time allowing freedom to the private sector to operate so that it can act as the main engine of growth. In the field of education, which was controlled dogmatically for so long, this will mean allowing opportunities for all, with the competition that will raise standards while ensuring access to greater numbers. But instead of celebrating this, the opposition harks back to the statism of the seventies, in simply demanding handouts, massive salary increases without any concern about the empowerment that should accompany benefits. In short, they want a country as passive as they are themselves, without the consistency of political principle that the last speaker, also from Matara, suggested was needed. Mr Chair, this budget is about stimulation and encouragement. It is designed to produce growth in which people are partners with government, in which the private sector works along with the State. This is no time for a Nightwatchman State, nor is it time for a Nanny State, both of which the opposition seem to recommend simultaneously, not separately in its diverse components, but together in the strange rainbow coalition they have formed. This tripartite opposition, which came together in support of a common candidate for the Presidency with no common principles, seems to have abandoned all thought now , and is wanting, it seems, handouts that will limit effort, together with restrictions on capital investment as well as investment in people. They pay no attention to facts in their assaults, as with for instance the JVP member for Gampaha, who declared that public servants had never previously been taxed. He forgets, perhaps because of his new-found allies, that it was President Jayewardene who removed taxes from public servants, precisely because he was unwilling to raise salaries, and provided this concession as compensation. Now, Mr Chair, public servants are at most levels reasonably paid, many at the higher levels have other sources of income, and in any case taxation will be imposed only on those who earn over Rs 50,000 per month. It is a pity therefore that the opposition misleads this House and, in harking back to what they see as the golden age of President Jayewardene, ignore both the positive things he did, in avoiding statist socialism and handouts, as well as his shortcomings which plunged the country into suffering from two violent insurrections. This government will continue with the positive path he sketched out, while twinning it with the concern for equity that is essential if we are to avoid the suffering that was his legacy.